Fantasmic is back! 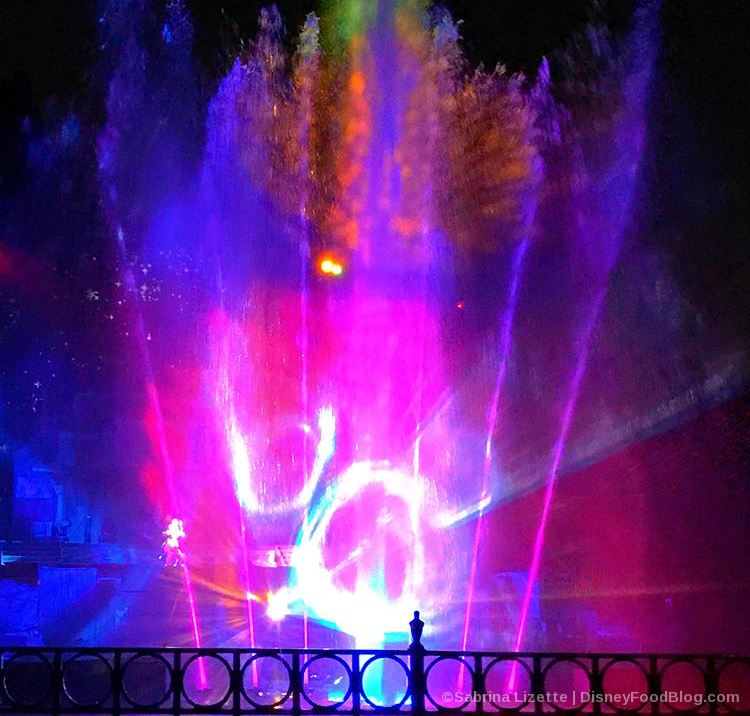 Fantasmic is back! Can you tell we’re excited?! 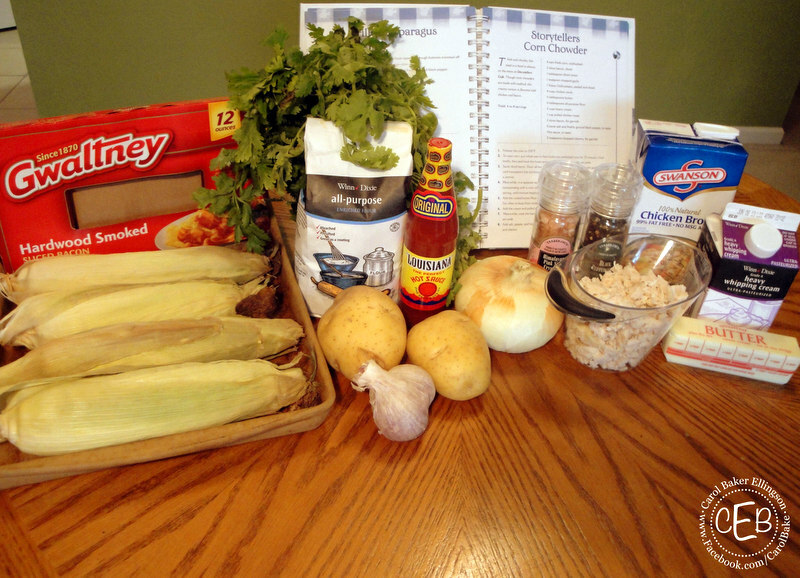 One of the best things about summer has to be enjoying fresh corn on the cob, straight from the farmer’s market! 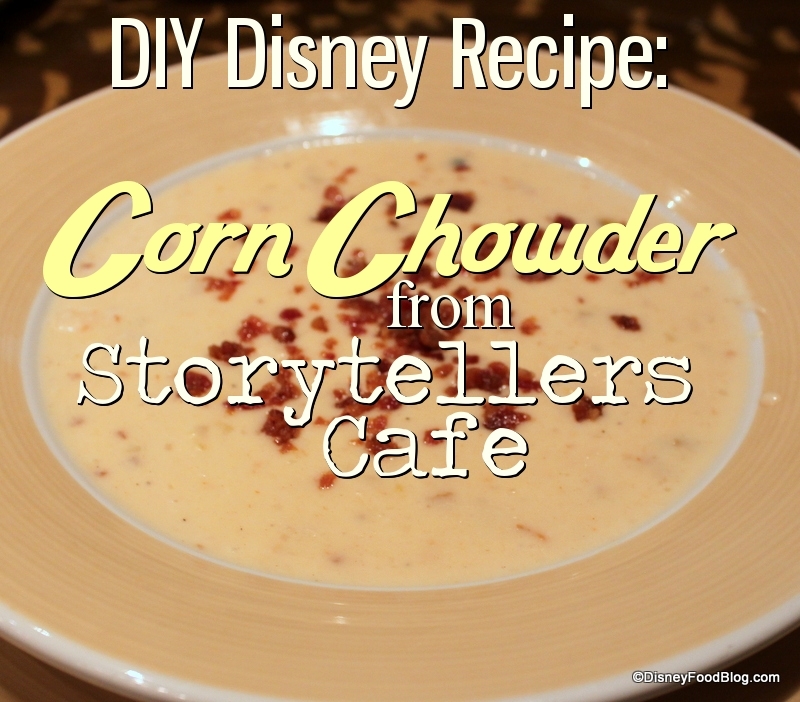 And one of our favorite recipes to make with that fresh corn is the Corn Chowder Soup from the Storytellers Cafe at Disneyland’s Grand Californian Hotel and Spa. 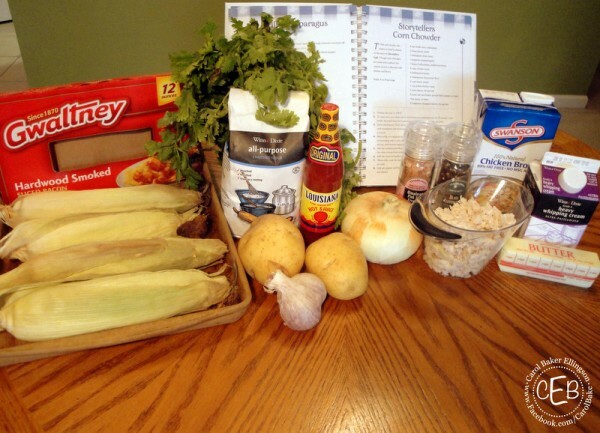 This is no ordinary corn chowder – it’s filled with fresh corn, potatoes, and chicken. 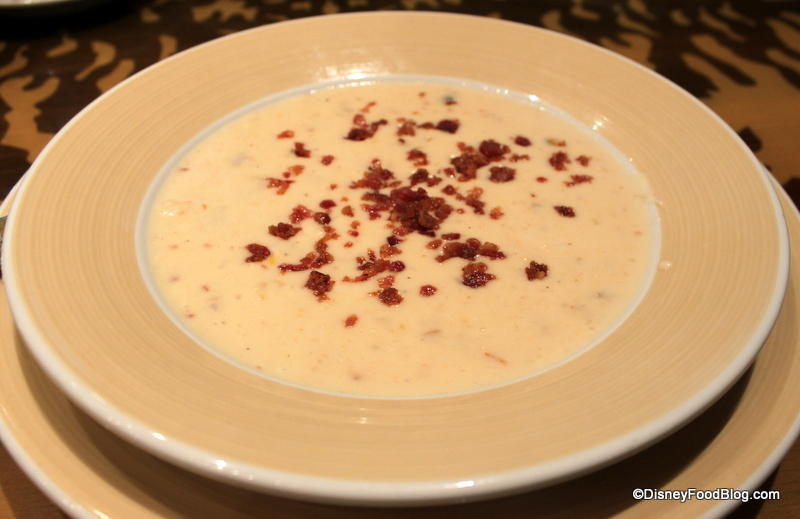 And, to make it even more delicious, it’s topped with crumbled bacon! 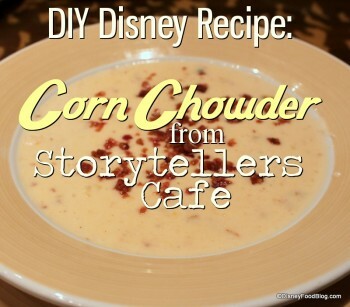 This dish really is a must-try at Storytellers Cafe and now you can make it at home any time you want. Making this soup will take some time, but it’s perfect for a rainy day! 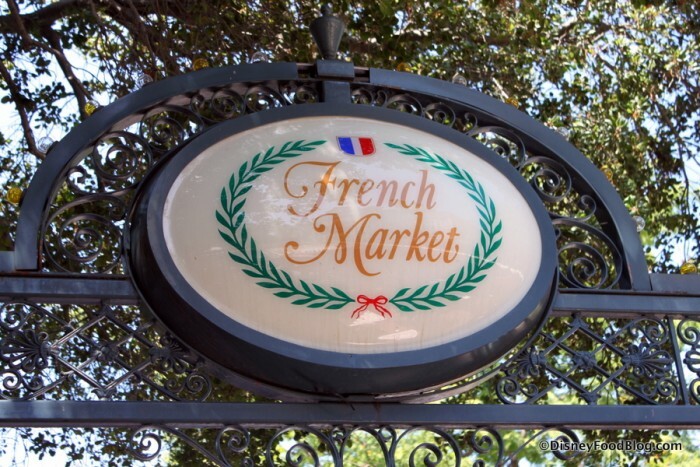 We’re back at Disneyland visiting yet another Counter Service gem, the French Market! You’re planning your first trip to Walt Disney World. Or your 50th. Or your 100th. And you reeeeeeeally want to know what NEW dishes you MUST try? Weeeeeeelllllllllll, we’ve got a few suggestions for you! 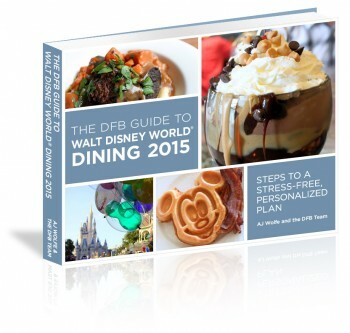 We’ve got about nine of our favorite you-HAVE-to-EAT-this dishes and snacks featured in our brand new DFB Guide to Walt Disney World Dining 2015 e-Book, which you can pick up today for $4 off using code 2015 right here! But I wanted to take a second to share just a few of those must-eat treats here with you as well. Yep — here at DFB, we always like to kick off each new year with some of our favorite treats spotted during the last few months. But when I sat down to brainstorm this post…well, at first it seemed like 2014 didn’t offer a whole lot of new stuff. That said, when I started scrolling back through everything we ate this past year, I realized there was a lot to be said for 2014 and its culinary prowess. There is one really big difference between this year and previous years, however. Most of our crave-worthy dishes are savory this time around! I know! WUT?!??!?!?!?!? Don’t worry, though — I’ve got a few sweeties thrown in. 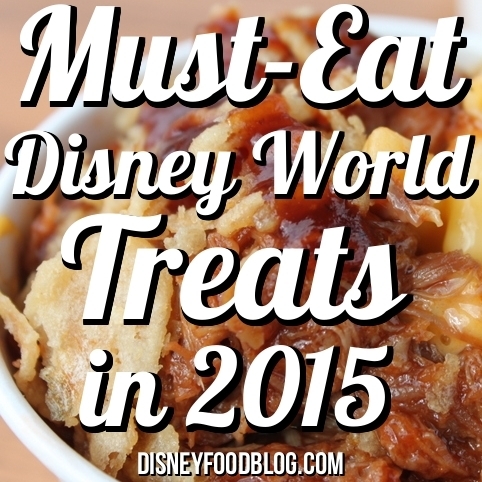 Here’s the New Food I Want to Stuff My Face with at Disney Parks in 2015! We thought that Mac and Cheese, that king of comfort foods, was enough. 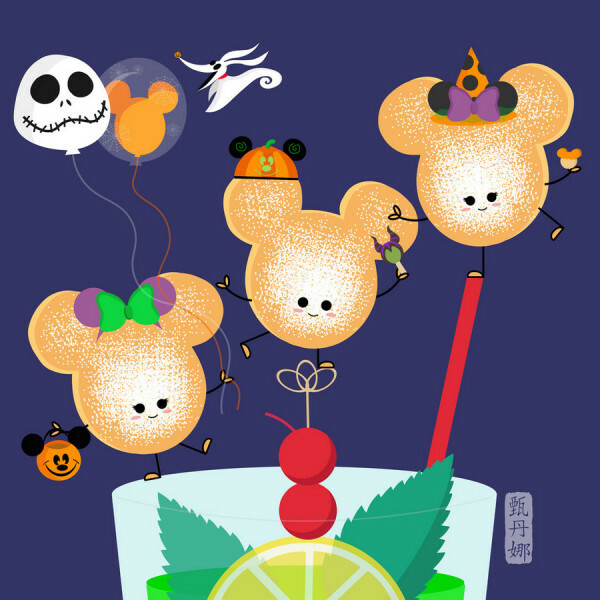 But little did we know what we had been missing, until Disney started putting additional delicious food on top of its cheesy goodness. We first saw the dawn of Gourmet Mac and Cheese — we’re just gonna call it that if that’s all right with you — a while back. Friar’s Nook introduced the concept, and we were smitten with their Bacon Cheeseburger Mac and Cheese and Blue Cheese Mac right away. BUT THEN — this happened. I was recently back in Disneyland for a visit, and I couldn’t resist booking lunch at one of my favorite locations, Storytellers Cafe. 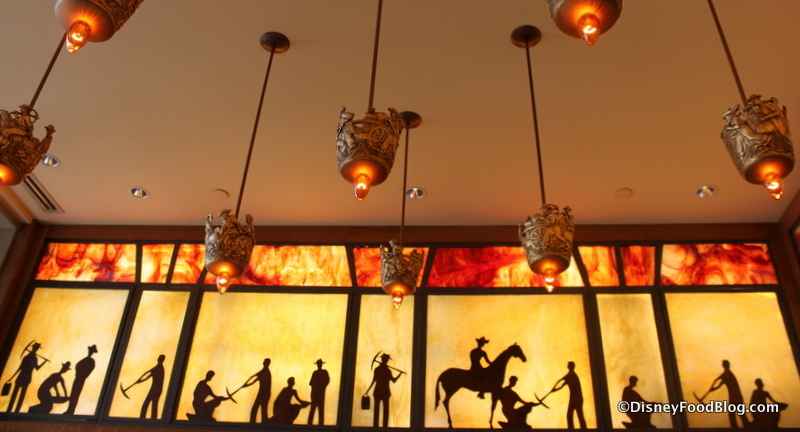 You’ll find Storytellers at Disney’s Grand Californian Hotel, which certainly lives up to its name. It is simply a gorgeous place to spend some time. With design that typifies the American Craftsman style, you are surrounded by larger than life, simple warm accents that make grand use of natural materials, like wood and stone. You find the same style carried through Storytellers Cafe. 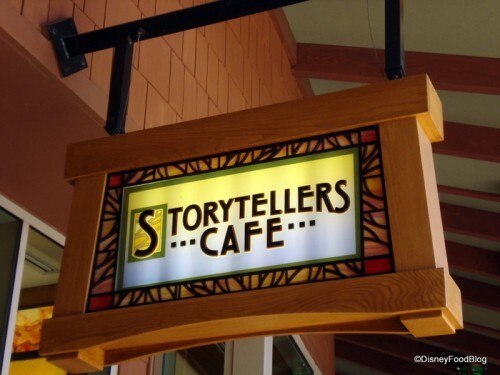 Two major design elements tend to dominate the decor of Storytellers Cafe: you’ll find murals and large paintings covering the walls. 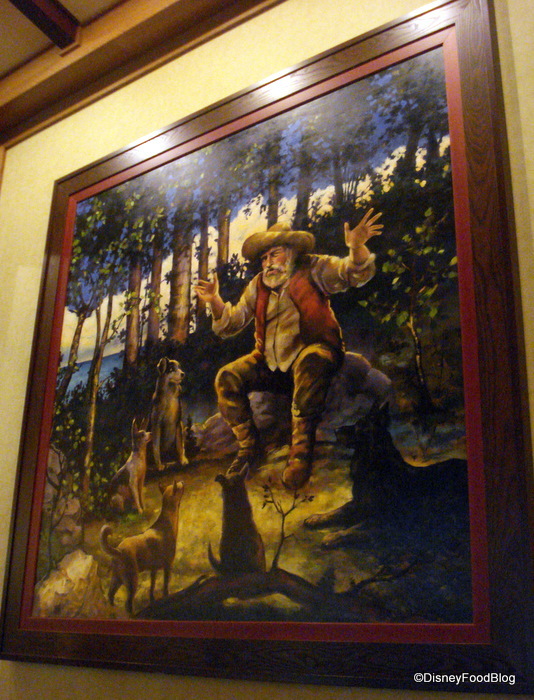 Paintings depict…storytelling, of course — featuring classic stories with California as their setting. Stained glass with warm swirls of color are a hallmark of Arts and Crafts design, and the stained glass softly filters the indirect light, which provides the perfect backdrop to these working man silhouettes. 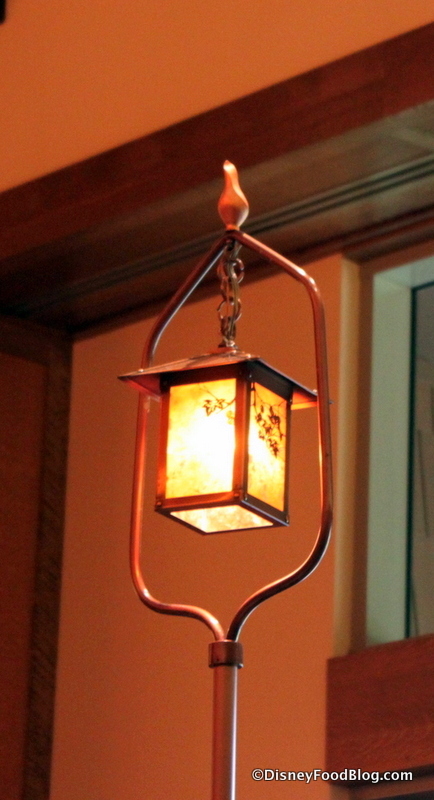 And be sure to notice the detail on the hanging lights as well! They’re really something special. Lanterns hung from copper stands distribute light throughout the dining room, and give the sense of bringing the outdoors inside. And as is often the case — don’t forget to look down! 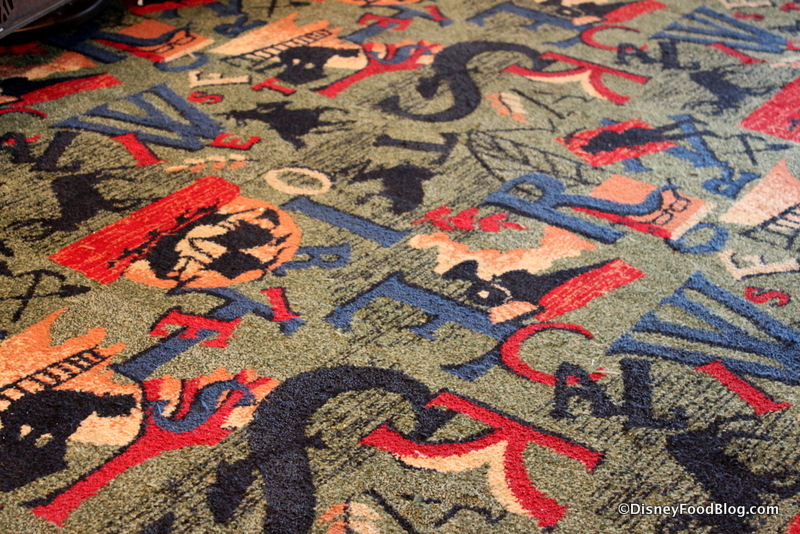 Even the carpeting conveys the theme and story of this spot with letters and more silhouettes. 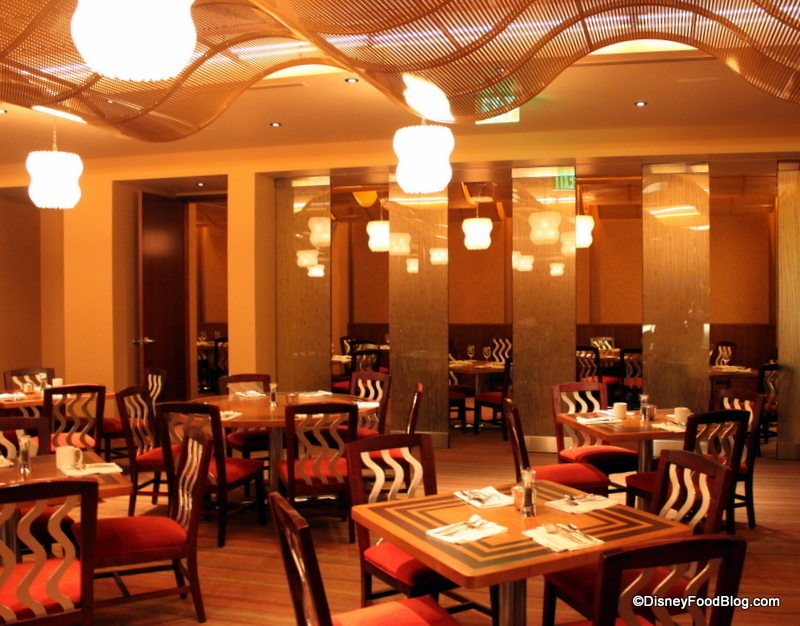 Today, we’re back at Disney’s Grand Floridian Resort and Spa to take in dinner at 1900 Park Fare! You may remember that the last time we were here, we were…nonplussed…unimpressed…frustrated…should I go on? Basically, we really didn’t have a great experience. But, as I always say, the only consistent thing about Disney restaurants is that they’re inconsistent. 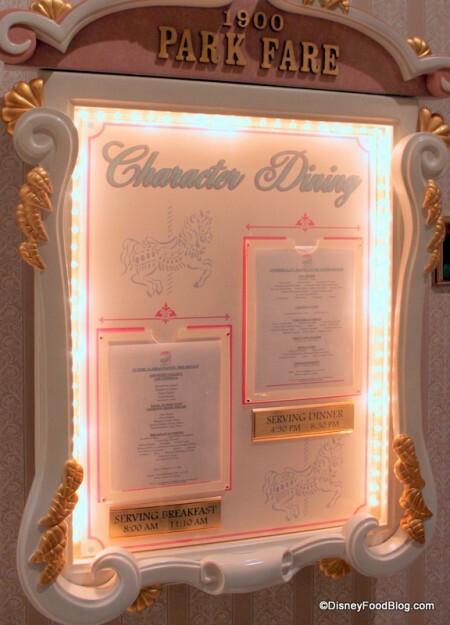 And some guests think this restaurant is fantastic — a great alternative to hard-to-get advance dining reservations like Cinderella’s Royal Table. So we’re back at this character buffet for another try… . While breakfast at 1900 Park Fare left us flat, this time around we’re checking out the dinner spread and hoping for the best! 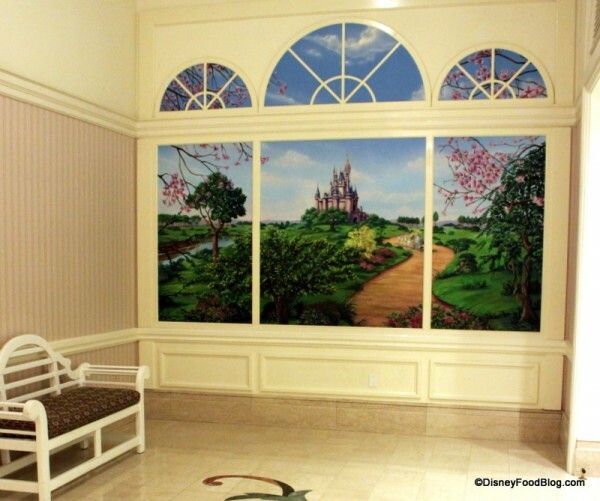 You’ll find 1900 Park Fare off of the ground floor lobby of the Grand Floridian Resort. 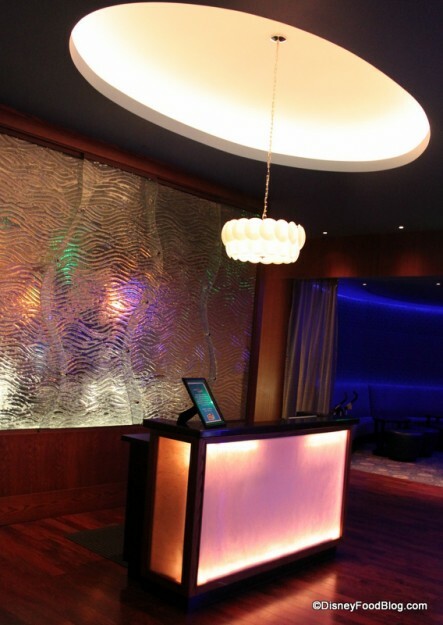 As you walk in the hotel’s front doors, the restaurant is located to your left, just past the Concierge desk. The antique carousel decor flows with the Victorian feel that you encounter throughout the resort. While you can’t see the individual items on this menu board that’s displayed out front of the restaurant, you can definitely see the attention to detail when it comes to theme. When you first arrive and check in for your reservation (you DID make a reservation, right? 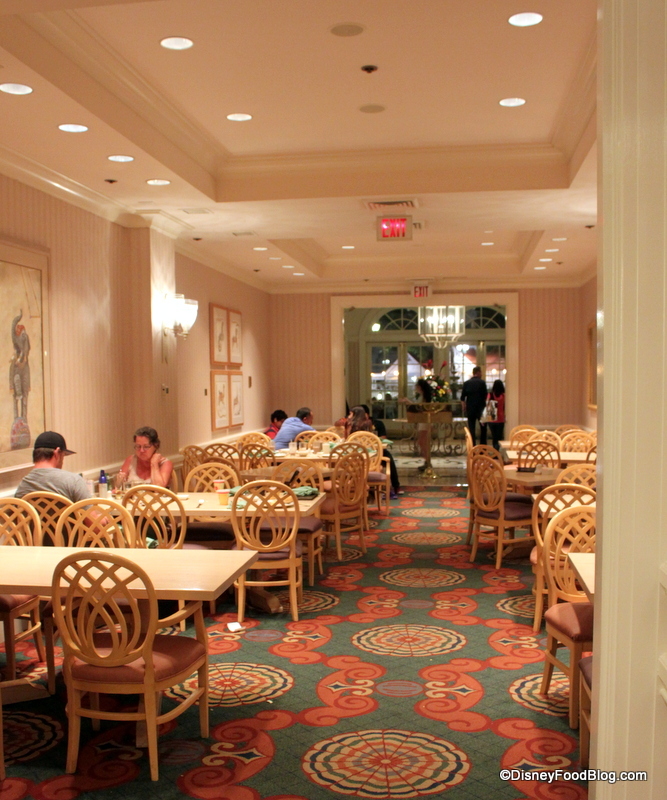 ), you’ll be given a pager and told to wait in the Grand Floridian lobby to be called when your table is ready. Note: this often takes A. LONG. TIME. In my experience, I’ve never been seated at this restaurant within 10 minutes of my reservation time. I’m always waiting quite a while to be called to the table. So if you’ve got little ones who are starving, bring some snacks to tide them over just in case. Once you’re called, you’ll be told to get in line to have your picture taken with this mural. No…you’re not getting your photo taken with a character. Just with the mural. This can be a fun memory for families, but you might want to skip the pic and head straight in for your meal. Be persistent and make sure they know you don’t want to take the photo. They’re pretty serious about getting you into that line. Once you head into the massive dining room, you’re greeted with more Victorian charm in pastel shades. Even without windows, the sheer size of the dining room makes it feel airy. There is a main area with high ceilings in front of the buffet, and some smaller dining rooms surrounding it with lower ceilings. I prefer these areas for seating, since they tend to be slightly quieter. Seating itself is fairly standard, with cushioned chairs and nondescript tables. 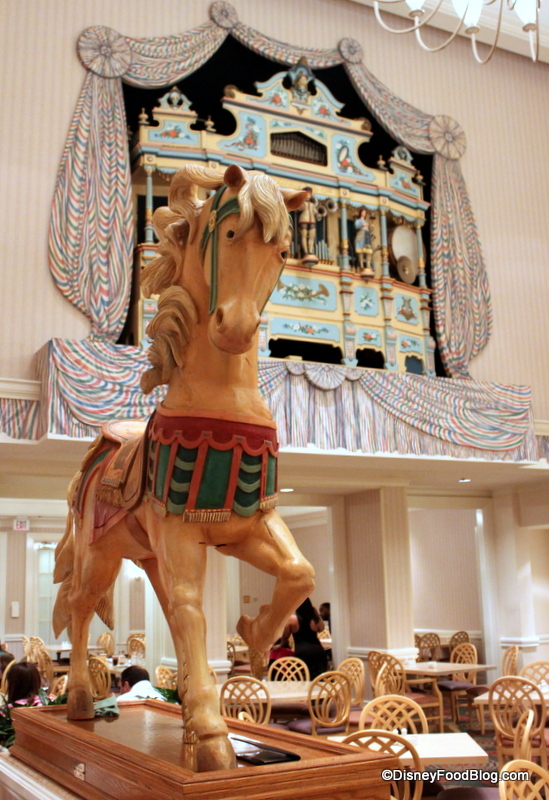 The main dining room makes the best use of the carousel theme. There are several large statues of fantasy carousel animals situated atop half walls and surrounded by plants. You should take a moment to look at these, because they’re really beautiful. 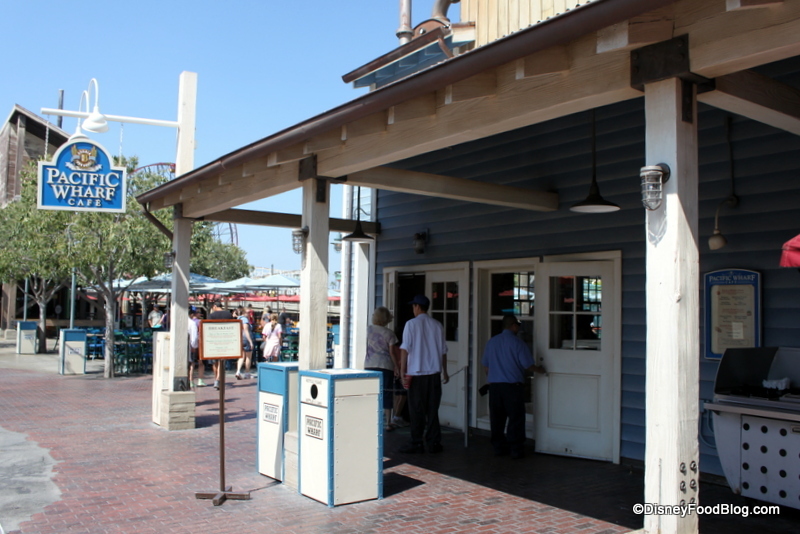 Today, we’re heading over for a light lunch and a treat at one of my favorite stops in Disneyland, Pacific Wharf Cafe at Disney California Adventure in Disneyland Resort! 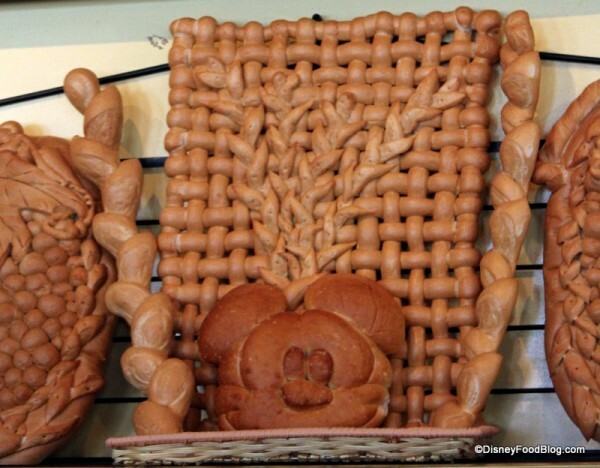 Bread, bread bowls, soup, and baked goodies are the name of the game here, so bring your carb-loving gene! Let’s head in to to see what tempting options we can find. Taking its theme from the famed Cannery Row in Monterrey, CA, Pacific Wharf Cafe is owned and operated by San Francisco’s Boudin Bakery. Imagineers have done a great job creating a space with the look and feel of the unique area. The Boudin Bakery is San Francisco’s oldest company — it’s been in business without interruption since 1849. They still use many of the original old world techniques, and their bread bowls are legendary. They’ve decorated the cafe with some fun bread creations — you can even get a bread Mickey! Serving counter service breakfast, lunch, and dinner, this is a great go-to spot if you haven’t made plans in advance for eating and you find yourself in need of a meal or snack. Head inside the open and airy space to order. 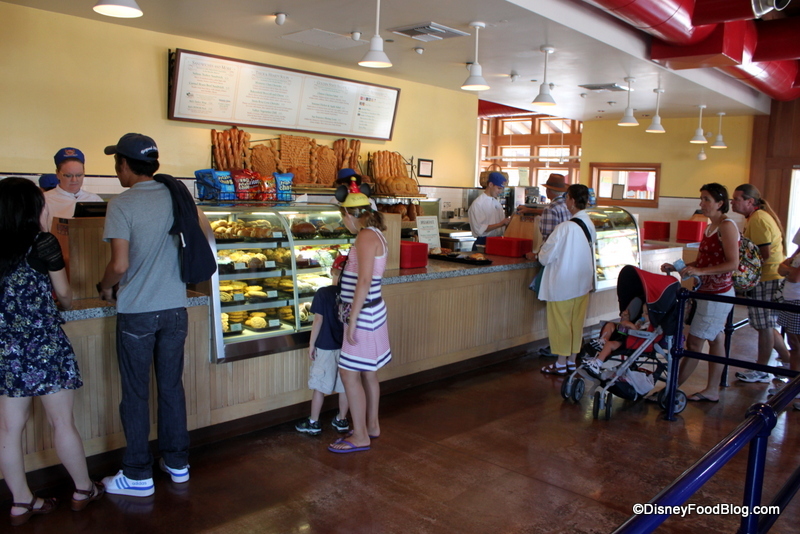 You’ll only find the counter and queue area once inside; all the seating is outside of the cafe. We hadn’t been back to The Wave for a couple of years, so we knew it was time to head back for dinner! 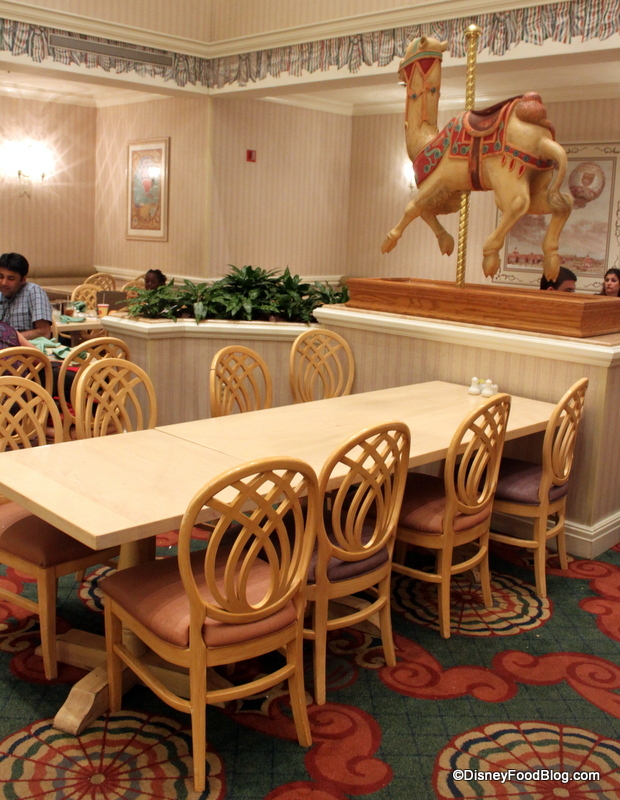 Available for breakfast (which also features a buffet), lunch, and dinner, you won’t necessarily find the same dish here that you had six months ago. That can be good and bad, but it’s always an adventure to stop in and see what’s new! 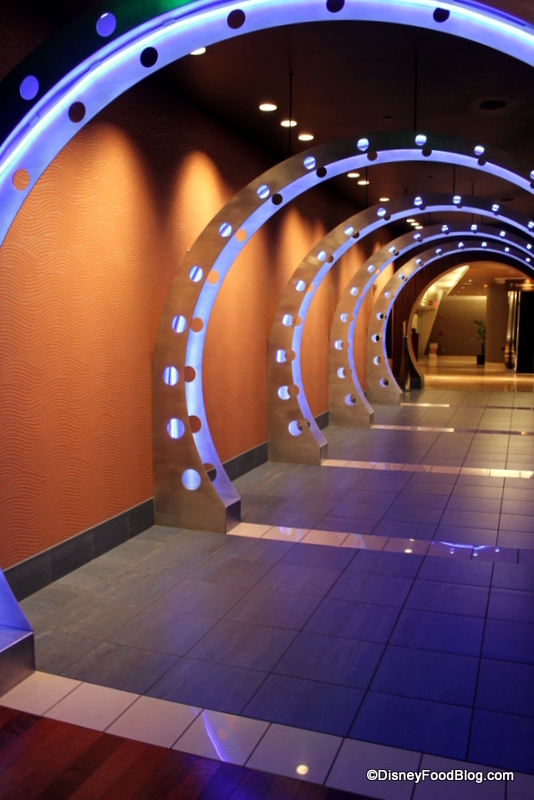 Located in the back left corner of the Contemporary Resort’s lobby (just past the concierge desks), you might miss The Wave altogether — except that they’ve dreamed up this groovy light tunnel for the entrance. 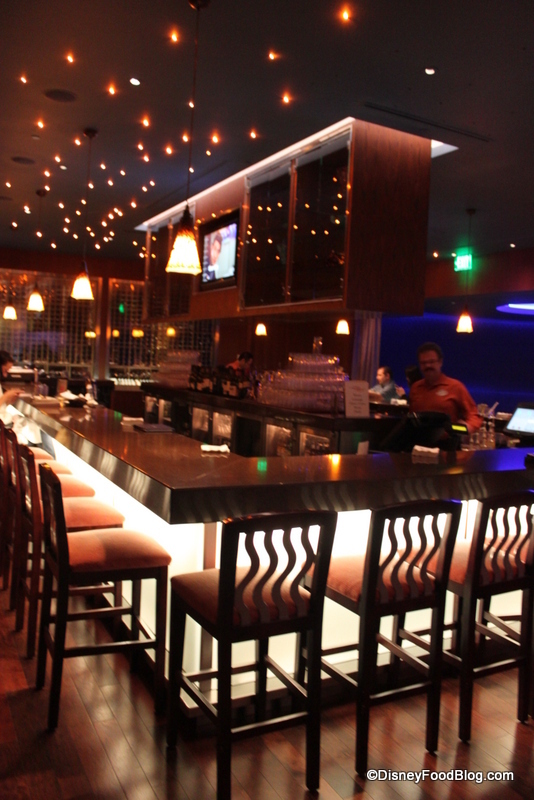 The atmosphere is modern and contemporary, and the check-in and bar areas look a little “night-clubby,” actually! 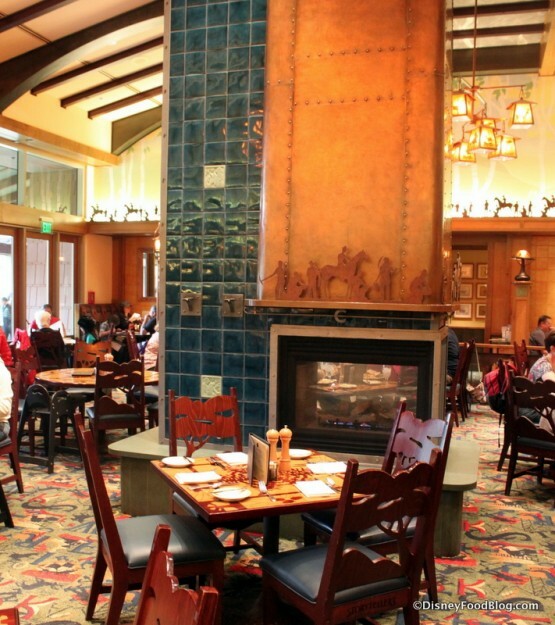 But never fear — this restaurant is very family-friendly. You make your way around the beautiful and expansive bar as you walk to the dining area. Here, you’ll see more waves in the decor, like the backs of the comfortable bar chairs. The bar features screw-top wines (more about that later) and fun organic local beers. 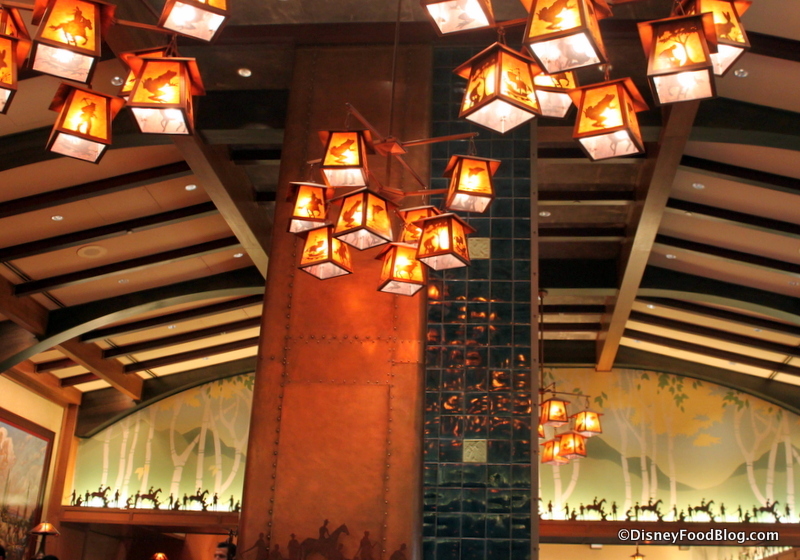 As you enter the sleek dining room, the color palette changes from blue to harvest gold. Waves (amber waves of grain, perhaps?) continue to surround you, even from above.